Ensuring that visitors have a wonderful user experience when visiting your website, whether for the first time or as a repeat customer, is one of the most important things you can do for your creative business. This is especially important if your business is predominantly visual or you offer bespoke products or creative services. Whether your website functions as a simple portfolio of your artistic work, or as a complex hub for your small business' products and services; above all it should reflect you. Visitors to your website should instantly be able to identify at a glance what you do and how you do it. According to studies, the average user will spend just 15 seconds looking at a page before they decide to click away or delve further into the website (and only then, the average session duration is 2 minutes, 17 seconds). If your website doesn't both entice visitors and potential customers by communicating exactly what you do, they probably won't want to stay to read more about you and your work. No-one knows you and your creative business better than yourself and everyone has something unique and special to showcase to the world. Why settle for an off-the-rail template design when you can utlise your individual style to create a personal and distinctive website for your business? If you don't feel your website represents you, get in touch with Applebox Designs today. You know yourself, when you are visiting a website that has complicated page structures and seemingly arduous menus; your interest soon wavers. This is the same for everyone; if you can't find what you're looking for within that all important 15 seconds, the chances are that you will look for it elsewhere. When you consider this in terms of the difference between earning a commission from a potential new client or losing it to your competitors, it is essential that you factor this in when creating your website. Navigation should work intuitively across all devices. Your website should encourage visitors to navigate their way throughout your website; whether they are browsing on their mobile during their daily commute or researching on their desktop computer at home, your menus should adapt for an optimal user experience, no matter the device. If you need help with updating the navigation of your website, get in touch with Applebox Designs today. As well as giving a clear overview of your creative business, your website should also engage and allow you to communicate directly with your potential customers. Are you offering an online service or product that customers can purchase directly from your website? Is your work commissionable for clients to request a quote? Do you want visitors to sign up to your mailing list? Your website should encourage visitors to interact via a 'call to action'. This can be in the form of a mailing list sign-up that will allow subscribers to receive periodic news & updates from you, or simply a large button featured prominently on your website encouraging visitors to contact you for more information. For more information about calls to action, click here for this month's Guide. It may seem like an obvious point, but visitors to your website (whatever their reason for visiting) will undoubtedly be interested in who you are and your reasons for providing your creative service. We are all naturally inquisitive beings, and, especially when we are faced with the infinite possibilities presented to us via the world wide web, we want to know everything there is to understand about each other. If you are offering a bespoke service, or showcasing your hand-crafted work, including an 'about' page will not only give a personal touch to your website but further highlight the benefits of what you are offering to your potential customers. Visitors will want to understand how you started your bespoke business, what experience you have and what inspires you to create, in order to consider commissioning your services or purchasing a piece of work. Treat your 'about' page as a chance to offer an insight to your business in the absence of a face-to-face meeting. 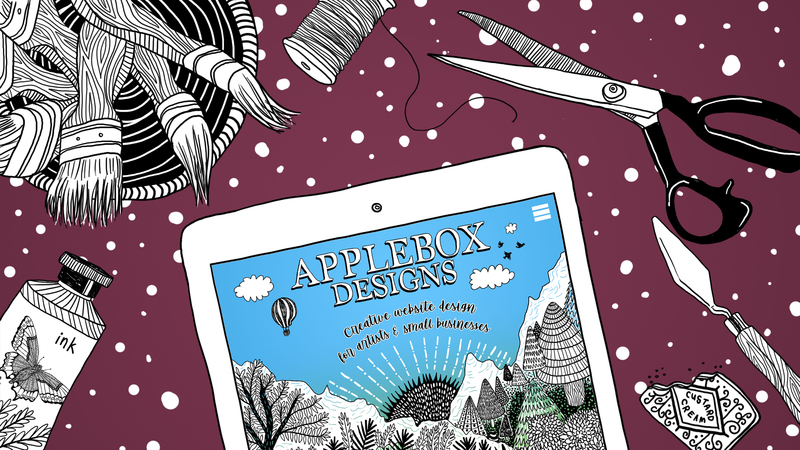 If you need help with updating your about page, get in touch with Applebox Designs today. Whether you are a small business offering a bespoke service, or a creative artist showcasing your work via an online portfolio, your website needs to communicate with your audience to attract a long-term relationship. If your website is the first point of contact that visitors discover you, either from searching for businesses like yours in Google or directly via your business card, you should always consider how your website communicates. One simple way to encourage this is to include a 'contact' page on your website, which will allow your visitors to connect with you directly. Social media both allows your customers to communicate directly with you, whilst at the same time enabling you to gauge their reactions to your work. How lovely does it feel to receive that 'like' on your latest post? Your website should list all of your social media channels, so that your visitors can follow you. This is an invaluable and free tool for communicating your messages directly to their timelines at the click of a button. Likewise, you should always list your website and contact details on your social media accounts for visitors to learn more about you. This will allow you to grow a larger symbiotic network for you, your customers and your business. If you need help with social media, get in touch with Applebox Designs today.